Once Stephanie steps on the plane from Hawaii to Newark, she hopes to put her hellish holiday behind her. But when her seatmate mysteriously disappears during the stopover in LA - to be found later in a garbage can - things are only going to get worse. More to the point, she still has to deal with the fallout from Hawaii. Both the men in her life refuse to talk about it and all Stephanie will say is... It's complicated. This is one of my favourite series. I always look forward to getting stuck into a new Stephanie Plum book, and this was no exception. Stephanie's life is always full of danger and relationship troubles, but this time things get really bad. The two men in her life have made things very complicated. So complicated that not even a vacation in Hawaii works out for her, and she runs away from both Morelli and Ranger. But the complications don't stop there. The man sitting next to her on the plane didn't get back on at LAX, and he's later found dead. Oh, and he left her a little souvenir--a photo she quickly discards. As soon as she gets home, strangers are popping up out of nowhere, all wanting the photo she doesn't have. Before long, the FBI, the fake FBI, a hairdresser, and a deranged killer are all after her. Everyone wants the photograph, and if she's not careful, she'll be the next one to be found stuffed into a garbage can. 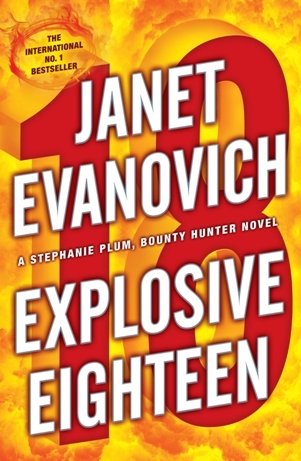 Explosive Eighteen is another awesome addition to this very fun and exciting series. Stephanie's always an excellent character to catch up with, as she accidentally gets herself into more trouble than she can handle. Yet, she always manages to make things work, somehow. In her typical bizarre and hilarious manner, she solves the mystery that threatens her life.